So I dropped the ball with my post last week about what the edible treat we made last week. It just didn't get done. I've made it a goal this year to try and let them make something to eat every Friday. Because 1) it's a great real life example of non-fiction reading, how to follow directions, etc. 2) by Friday we're spent and need something to anticipate and 3) it's fun. 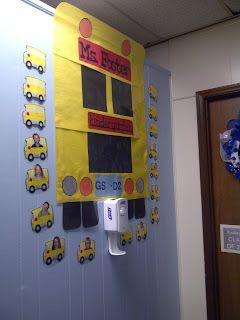 Our K team at my school adopted a "Wheels on the Bus" theme to kick off the year. Big shout out to DJ who made the bus for me. And got the cardstock buses. She's retiring this year. Can you see why I'm going to miss her-greatly?! When you're walking out the door and you remember it's Friday and you still haven't got the rest of the food items, proceed to your nearest Kroger/Walmart/convenience store. Do not pass go, do not collect $200-just get to the store. While there, purchase Rolos (I got the minis that are always by the mini-Reese Cups, which, if we're being perfectly honest, are just small bites of heaven on earth) and some red hard candy. Because I couldn't find the Red Hots candy, I went with Hot Tamales. Give the the red candy for the stop sign-the Hot Tamales were goo because they could make it extend as though the stop sign were actually sticking out. Enjoy with a small glass of water, milk, or beverage of your choice.